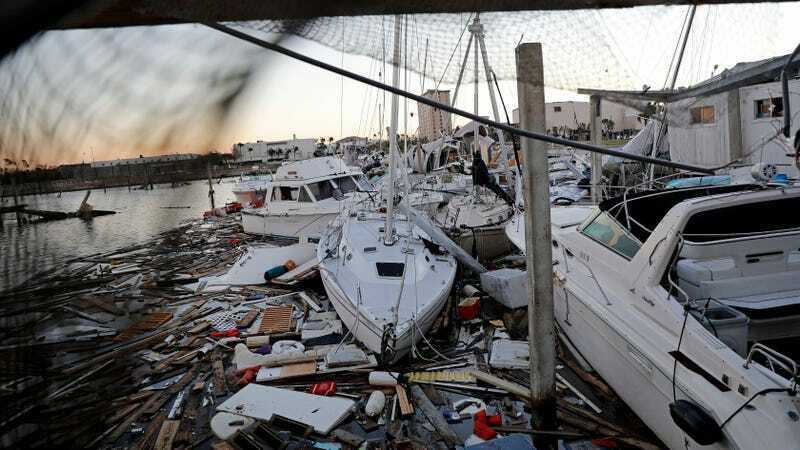 Damaged boats sit among debris in a marina in the aftermath of Hurricane Michael in Panama City, Fla., Friday, Oct. 12, 2018. The Federal Communications Commission on Friday released an update regarding areas suffering wireless, cable, and radio service outages due to Hurricane Michael, which made landfall near Bay County, Florida, on Wednesday. “As of today, Hurricane Michael has had a serious impact on communications services in the Florida Panhandle and parts of Georgia,” the agency said. The storm, which swept across six states, is one of the most powerful to hit the continental U.S. on record. At the time of writing, at least 16 deaths have been attributed to the hurricane, a Category 4 upon landfall. The good news, per the FCC, is all 911 calls in the disaster area are now being successfully re-routed. But some are still down. Currently, eight call centers are unable to receive emergency calls, including six in Florida (Lynn Haven, Panama City Beach PD, Panama City PD FL, Springfield PD, Tyndall Airforce FD, Tyndall Airforce Law) and two in Georgia (Berrien County SO, Bulloch County). Roughly 12 percent of cell sites in the disaster area remain down, an improvement from Thursday’s 19 percent. More than 50 percent of the cell sites in four Florida counties (Bay, Gadsden, Gulf, and Washington) remain out of service. County map shows Hurricane Michael disaster area. According to the FCC, more than 250,000 Floridians are without access to cable systems, which may include a loss of telephone, television, and/or internet service. Roughly 100,000 subscribers in Georgia and 18,000 in Alabama are similarly affected. As many as 27 FM Radio stations and 5 AM Radio stations have reported outages.